Now you can feel like you're on an island vacation with the Wrap and Snap Choke-Free Dog Harness in Surfboards and Palms! 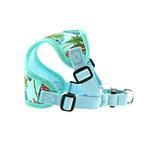 Embrace a beautiful and relaxed tropical lifestyle with this easy-to-use Wrap and Snap Choke-Free Dog Harness. The Wrap and Snap Harnesses by Doggie Design are easy to use, lightweight, soft and feature dynamic colors and prints. 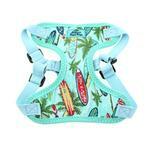 You'll love how fresh this surf print looks on your little pup. It's a ready-to-wear style that is comfortable and durable. Wrap and Snap Choke Free Dog Harness by Doggie Design - Surfboards and Palms Customer Photos - Send us your photo! Roscoe is a fun-loving, extra scruffy Brussels Griffon/Shihtzu mix. He loves car rides, especially when he is in his Baxterboo gear! Posted On 10/26/17 by DEBORAH QUICKSALL from Biloxi, MS Yes, DEBORAH QUICKSALL recommends this product! Love this. Fits well. Adjusts well. Bright and colorful. Nice for my little man. Posted On 07/23/17 by Karlee B from Atlanta, GA Yes, Karlee B recommends this product! This is the second Wrap and Snap Choke Free harness I've bought and I continue to love them. I wanted a fun summer print for when I took my yorkie to the beach this summer and the surfboards on this harness were perfect. He got a lot of compliments. The fit is great and the adjustable straps mean that my pup is comfortable and secure. Posted On 06/29/17 by Lynda M from Seattle, WA Yes, Lynda M recommends this product! This harness fits well, and is true to the measurements. It fits my dog comfortably, and is quite sturdy and very securely stitched. It is adjustable is 4 places, for a perfect fit. I've received many compliments on it already, and only wish I could find a matching leash! Posted On 06/17/17 by Kelley M from Olympia, WA Yes, Kelley M recommends this product! Love this harness! It is very well made and is very secure. True to size according to the sizing guide. The surfboard print is so perfect for summer! Posted On 06/15/17 by Diane C from , FL Yes, Diane C recommends this product! I ordered 2 harnesses for my new Maltipoo. I got them very quickly and they are beautiful. I got one for him now and when he grows more. I love the easy ordering and love them. Plus I got a 20% off next order coupon. I will definitely be ordering again. THANK YOU!! Posted On 06/14/17 by Joanne T from Toms River, NJ Yes, Joanne T recommends this product! I love the wrap and snap harness and have ordered 6 thus far in different colors. They're easy to adjust and extremely comfy for your pup. An awesome Harness! Posted On 06/09/17 by Holly S from Calimesa, CA Yes, Holly S recommends this product! I really like this harness. However, there isn't much wiggle room. I measured my dog according to the chart. It fits perfect, but like I said no wiggle room. I would recommend this product for an older dog that isn't going to grow much more. It is a beautiful harness. Posted On 06/05/17 by Joanne T from Toms River, NJ Yes, Joanne T recommends this product! This is one of the cutest wrap and snap harnesses I've bought thus far. Jax has several in various colors to compliment the day's event. Definitely one of the most secure and comfortable harnesses available. Posted On 06/02/17 by Joanne T from Toms River , NJ Yes, Joanne T recommends this product! Summer color with adorable design perfect for my little Jax. I love the wrap and snap harness for my 2 yr old morkie. Posted On 04/18/17 by Dianna Bowdish from Ashland, OR Yes, Dianna Bowdish recommends this product! This harness is just adorable, well made, and reasonably priced. Posted On 04/09/17 by Tracy from Arlington, VA Yes, Tracy recommends this product! This harness is so cute for summer! I typically buy medium-sized harnesses, but I sized up to large and it fits great! It also has four adjustable straps on the legs. Posted On 04/01/17 by Pamela G from Rancho Murieta, CA Yes, Pamela G recommends this product! Easy to put on and take off. It's adorable, can't wait to take him to the beach. He will fit right in with the surfers! We love wrap & snap choke free harnesses and this one with the palm trees and surfboard designs is great for the upcoming spring and summer seasons. 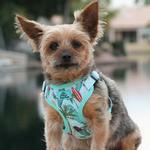 My dogs will look stylish, but stay safe, while wearing these harnesses on their walks. They are easy to put on and take off and allow a secure fit. I was very happy with the variety of choices for what I was looking for. Found a very nice nylon winter coat for my Daschund. Website easy to navigate. Checkout was easy.